S.T. Coleridge is buried in the aisle of St. Michael's Church, Highgate, London, England. He was originally buried at Old Highgate Chapel but was re-interred in St. Michael's Church in 1961. Coleridge was educated at Christ's Hospital, London and at Jesus College Cambridge. In 1794 he met Robert Southey in Oxford and the pair became close friends - planning a Pantisocracy society together. They also courted and married the sisters Sara and Edith Fricker. In 1796 Coleridge moved to Nether Stowey in Somerset. While here he met William Wordsworth who was living at Alfoxden House. This was the beginning of a fourteen year relationship which proved to be one of the most creative partnerships in English poetry. It was Wordsworth who suggested that Coleridge write The Rime of the Ancient Mariner. It was also at this time that Coleridge completed his opium inspired masterpiece Kubla Khan. In 1798 the pair published their ground breaking joint collection of work: Lyrical Ballads which was a forerunner of romanticism. In 1800 Coleridge moved to the Lake District to be close to Wordsworth. By this stage his marriage to Sara Fricker was deteriorating and he fell in love with Wordsworth's sister-in-law Sara Hutchinson. By 1811 Coleridge had become increasingly reliant on opium. This, combined with pressure of work, led to arguments with Wordsworth and the irretrievable breakdown of their friendship. In 1816 Coleridge sought treatment for his opium addiction with Highgate surgeon James Gillman. He moved into Gillman's house and remained there until his death on 25 July 1834. This was a happier period in Coleridge's life and he became known as the 'sage of Highgate'. 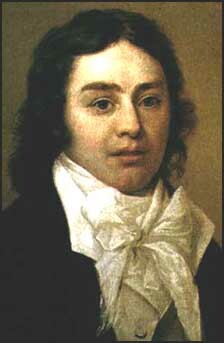 An autopsy, carried out on Coleridge's body at his own request, revealed that he had been suffering from an enlarged heart. He wrote his own epitaph in the last year of his life. See also Lake Poets, romanticism and 'Poets on Poetry'.